Enter the Galactic Green Handgun Contest! 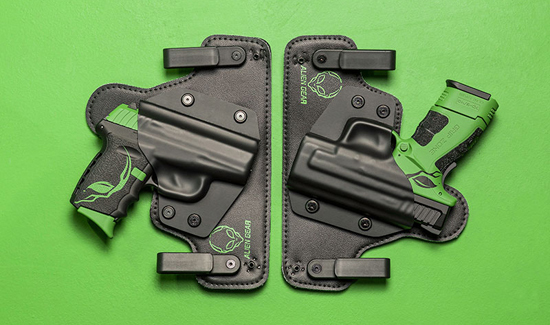 Alien Gear Holsters, the most comfortable, concealed carry holsters on the planet announces a galactic green handgun giveaway that anyone can win! Starting now, contestants can win by making a fun video featuring your Alien Gear Holster and uploading it to YouTube. Creativity is encouraged! The top videos will be selected and voted on through May 2015. The top two videos with the most votes will win! Be sure to subscribe to the Alien Gear Holsters’ YouTube page to keep up with all the latest entries. The more you encourage friends to like or share your video, the better chance you’ll have of winning. 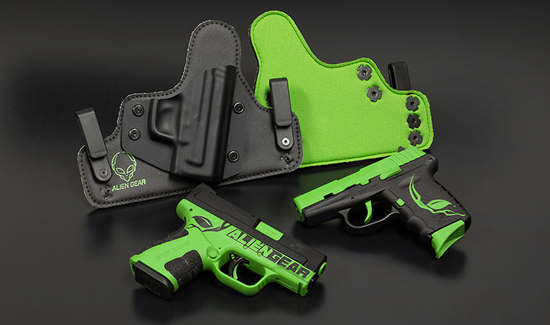 The videos with the most votes will receive an alien green, custom-coated Springfield XD Mod.2 or SCCY CPX-2 from Mad Custom Coating ( madcustomcoating.com ), plus a limited-edition Alien Gear IWB Holster, featuring a one-of-a-kind green Alien Gear logo stamp and matching neoprene on the backside. Visit AlienGearHolsters.com/concealed-carry-contest to enter today! I would really love to win one, PLEASE pick me @!! !